The most comprehensive story you’ll ever read about the aborted BMC 9X programme – the ill-fated Mini replacement, engineered by the man who created the original. 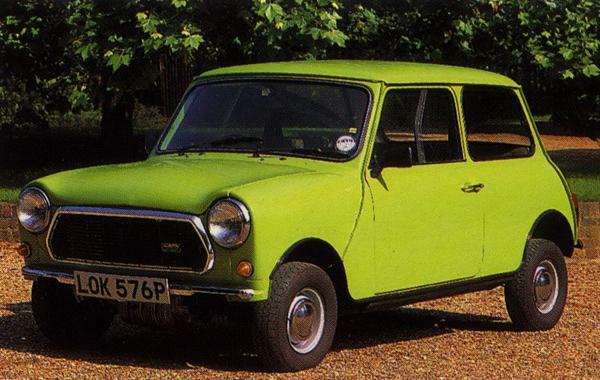 Was it the world’s first supermini? Sometimes, a crisis can truly focus the thoughts of an individual – and, in the case of Issigonis, a proven and gifted designer, the Suez Crisis had proven this to be true. From the Leonard Lord edict to design a car to meet the fuel crisis head-on, a true stroke of genius resulted in the creation of the Mini. It was the inspired idea of mounting the engine transversely, above the gearbox, married to tiny road wheels (designed especially for the Mini) and the compact suspension system that resulted in such a small package. Okay, the Mini was not the first small car by any means but, because of its remarkable packaging, it was the first truly small car that could offer accommodation for four 1959-sized adults. However, the Mini was rushed into production and, because of the desire to meet Lord’s production deadline, it suffered from many problems: the engine accessibility was dreadful in comparison with more conventional cars, which led to garages initially holding their hands up in alarm at the sight of a Mini in their service bays. The transmission-in-sump layout adopted by the Mini was hampered by the addition of an extra transfer drive (when the engine orientation was changed half-way through the development programme). Subframes added during development added weight and cost (not to mention, corrosion worries), and the body engineering had been compromised to such a degree that it leaked like a sieve in the early days. Not that it mattered, of course – following a slow start, the Mini soon became a bestseller, and soon became a classless icon as well as an inexpensive, clever, car. However, Issigonis had moved on… following the development of the BMC 1100 and 1800 models, as well as his initial work on the Maxi, he turned his attention back to the Mini, and how best to replace it. By 1967, Alec Issigonis took the rather unprecedented step of requesting that George Harriman allow him to step down from his role as Head of New Car Development, so that he could concentrate his efforts on creating a replacement for the Mini. Needless to say, Harriman was not keen on the idea, as he knew that there was a need to get on with the development of the next generation of front-wheel-drive models, that Issigonis had such a flair for designing. However, he reluctantly agreed to Issigonis’ request on the understanding that this development programme was not in the mainstream BMC development schedule, and there would be no guarantees that production of the new car would be sanctioned. Soon, Issigonis gathered around him a small team of hand-picked engineers – as he had done previously with the Mini – in order help him with his creation. This was the way that the great man preferred to work, and he figured that if he were surrounded by people he truly trusted, the creation process would be greatly accelerated. And it was so: by the start of 1968 and very much in the background compared with wider company events, the wonderful little car began to take shape. Working to the strictest set of goals, Issigonis managed to create a totally new car which owed absolutely nothing to its predecessor. What emerged was nothing if not radical and amazingly, the 9X, as it was called, managed not only to be shorter than the Mini (9ft 8in, as opposed to 10ft and a quarter inch), but also lighter. Because of some very smart thinking, the 9X was also somewhat roomier than the Mini. Even today, these facts seem almost impossible to believe, but the one prototype produced, which can still be seen at the British Motor Museum at Gaydon is a testament to the Issigonis mastery of small car design. Interior packaging was superior to the Mini, and offered more front and rear head and legroom, although, the driving position was similarly compromised. The dashboard design was classic Issigonis – an extremely slim fascia and strip speedometer, visually very similar to that of the Austin 1800 or similarly styled Austin-Morris JU van. The styling of the 9X was smart and contemporary (penned by Fred Boubier and Syd Goble, with some prototype building being carried out by Pininfarina) and, like a true car of the 1970s, squared-off in its outlook. Visually, it was rather similar to the later Peugeot 104 (a car that Pininfarina styled), and it would have fitted into its anticipated market perfectly. Importantly, the 9X also featured a hatchback – something that Issigonis did not necessarily think a Mini-sized car needed, but accepted that customers disagreed with his sentiments. George Harriman was unable to offer Issigonis any commitment to production, as discussed when the idea was originally mooted, and because BMH (BMC and Jaguar) were heading rapidly towards a Leyland takeover, the likelihood of a huge investment to replace a successful, low-profit car, was remote. As it was, much of the final development of the 9X was undertaken under Leyland ownership and, once it became clear that there were many, many budgetary constraints, 9X production was becoming a more remote possibility – a pipedream, even. Even so, this practically unofficial and small-scale effort by Issigonis and his team would suffer no compromises: he insisted the new car should possess an entirely new chassis. In true 1970s Euro-norm, the 9X was given McPherson struts at the front and a beam axle at the rear. Issigonis chose something utterly conventional (by 1970s standards), shunning the Dr Alex Moulton-designed fluid set-ups which worked so effectively in the 1100 and 1800 models. At the time, even the Mini used the Hydrolastic system (it was designed from the outset to use this arrangement), but on the smallest car in the range, it had been met with mixed reviews. Issigonis decided on the conventional set-up because it was cheaper to produce, and he stated that it could be tuned to offer a softer and more compliant ride than the rather bouncy Mini. There were other, darker, reasons for going with the steel system – either way, though, it proved that Issigonis would go with a ‘template’ design, if he thought there were real benefits. Issigonis chose to go to town with the 9X, and ensured that it would have a new, lighter, and more efficient power unit. The engine design team was headed-up by John Sheppard and, along with the rest of the 9X, the new four-cylinder unit dubbed the ‘DX’, was very quickly produced: it took just nine months to make the transition from drawing board to test bed. It displaced between 750cc and 1000cc and had a specific power output of 60bhp-per-litre – with an overhead camshaft design, that very unusually for a British design of that era, sported a cam-belt as opposed to a cam-chain. At the insistence of that Issigonis, the 9X would be designed to use a new engine/gearbox package that weighed no more than 200lbs, as opposed to the 340lb of the A-Series package. Because of these demands, aluminium alloy was used for the cylinder head and sump and cast iron for the engine block. The 1.0-litre version of the prototype engine that they produced put out a healthy 60bhp (far in excess of the 40bhp that the 998cc Mini could muster). The new gearbox was a two-shaft design that was intended to be sited beneath and behind the engine (not directly below it) and was, therefore, supposed to be a lot quieter as it did not rely on the transfer gear arrangement found in the existing package. The unit was designed also to be of a modular design, and Issigonis’ team duly drew up plans for a six-cylinder version of the engine to be introduced in the larger version of the 9X, intended to replace the 1100/1300. He added: ‘The roll of drawings just happened to be those of the DX engine gearbox which were fully dimensioned but without any tolerances. Now here was something for a fledgling engineer to get his teeth into. The engine consisted of a cast-iron cylinder block (in which the cylinders were all Siamesed (there was no cooling water channel between adjacent cylinders), a separate aluminium crankcase and aluminium cylinder head with overhead camshaft. ‘What was really exceptional was that the alternator was arranged in somewhat motor cycle fashion in that there was a stator sitting in a housing with a magnetic rotor on an extension from the crankshaft. It was necessary to maintain a gap between rotor and stator of .030 +/- .010inch. And this is where the tolerancing was most critical. He added: ‘The tolerance build up between the crankshaft and the alternator rotor was even more marked. The crankshaft had a squared off end facing on to which the flywheel was spigotted in much the same way as the E-Series of the time, there was a normal clutch pressure plate fixed to the flywheel by three flexible steel straps onto which was bolted an aluminium extension which carried the alternator rotor. ‘While there was obviously a build up of tolerance in this area the most important aspect was the “Swash” or run out on the flywheel face which would be converted to an eccentric motion and somewhat amplified at the alternator and wipe out any clearance that was there. ‘Engineering took the view that they would always achieve any tolerance that we put on a drawing. I put this to the test by getting the E2 inspection shop to demonstrate how they were controlling this tolerance. I seem to remember that it took most of the afternoon to put together a jig for doing this, three crankshafts and five flywheels before we found a pair that ran within tolerance for the E4 engine. Interestingly, but in a sad way, some of these 9X engines were used in standard Minis so they could undergo development and, shortly after the death of the car, one such car was lent to a BL Director – with the explanation that it was a Daniel Richmond-tuned engine under the bonnet. Richmond was one of the engineers who had assisted Issigonis in the design of the new engine, so it was perfectly conceivable that this would be the case. The whole package was designed with a view to simplicity of assembly and low cost, benefiting not only the manufacturer, but also the customer (through low purchase price). These aims would surely have been successfully met, as the 9X used an amazing 42 per cent less separate components than the Mini. The 9X would prove to be the last fully designed car from Alec Issigonis and, sadly, it was cancelled soon after the completion of the only fully-engineered prototype; the first victim of the BMH-Leyland merger. So, why was this intriguing car never built? Following the creation of British Leyland, a new management team took control of Austin-Morris. In the eyes of Donald Stokes, many of the financial problems encountered by the entire corporation lay at the door of Austin-Morris. As a result, ex-Triumph man George Turnbull was drafted in to run Austin-Morris, with the intention of improving profitability and efficiency. As it was, the 9X, as brilliant as it was, would need a great deal of investment to get into production (new engine, new body, new platform), and the original Mini was selling very well thank-you-very-much. Also, it was seen that the main priority lay in the middle-market (where sales of the 1800 were nowhere near acceptable) and so the 9X was shelved. Was it right to can the 9X? The question remains – was the decision to can the 9X the correct one to make? Viewed from an enthusiast’s perspective, obviously not. The car was a quantum leap over the Mini – it offered so much in the way of innovation, that it would have perhaps made the larger superminis that appeared during the 1970s seem too big to be relevant. The style was largely right, although it would have undoubtedly needed a front-end facelift to be truly saleable. From a business perspective, British Leyland could ill-afford the 9X, when their small car sales were so healthy, whilst their larger cars were suffering so much. The 9X could have been developed into a range to replace both the Mini and 1100/1300, but because of its cost and BLMC’s lack of funds, it needed to be prioritised… and that seems to be what happened. Although the 9X programme was never adopted for production, it did not stop Alec Issignonis working on the project in his new office in Longbridge – as he was now working as a consultant for BL. Throughout the Seventies, and into the Eighties, Issigonis would regularly contact BL management, requesting another look at his constantly evolving 9X project. As can be seen in the British Motor Museum at Gaydon, the final incarnation of the 9X project was an intriguing six-cylinder engined MG Metro. Sadly, the call from upstairs never came – and, in 1987, Graham Day terminated Sir Alec’s contract. The biggest crime committed by BLMC’s management, then, was not that they did not put the 9X into production, but that they did not learn more from it when they finally decided that the company needed to build a new small car. The 1980 Austin Metro was an excellent car in its day, but a 1972 9X still remains a much more tantalising proposition. Perhaps this type of car will be manufactured in China and imported in Europe. Promoted as a…. brand new car. Gearless ??? ….. not just a automatic, but gearless, hmmm…. Regarding the DX engine, how far upwards could the engine have been potentially expanded to beyond the 100 bhp 1275cc 6-cylinder? Though it would of been a suitable replacement for the A-Series, could the DX have been (in theory at least) expanded up to say a 1400-1900cc 4-cylinder for example, in place of the lower-end E-Series? The Mini 9X was a quantum leap ahead of anything else BL had at the time. It would have benefited from having the alternator position relocated though to something more conventional. If the gearbox used the engine oil for lubrication then this may have benefited too from redesign. The rest of the package (with a bit of restyling and less emphasis on saving space)would have been perfect to have used as a template for future front wheel drive models. Think how much better an enlarged 9X with modifications suggested would have been than the dreadful Allegro? As it is, by the time BL had come up with a suitable front wheel drive template with regards the Maestro, it was far too late. They had missed the boat and the public had lost faith in the company. I was a petrol engine designer at Longbridge from 1970-76 when the 9X was being shot down by Harry Webster. Issigonis’ arrogance cannot have helped his cause at all though all those who worked for him that I knew held him in very high regard. I was not involved with the 9X; I was a designer on the H, K (slant back engine) and O series. We were a tight bunch and we knew (and were friends with) even those engineers locked away down below in the 9X design office. I later worked with Stan Johnson and Fred Eysenck when I joined the Advanced Engine Design Team based in the Roundhouse. Reading of the 9X alternator design reminded me of a later alternator designed by the 9X team. It involved around 100 small magnetic rods, each moulded into a tooth of the camshaft drive belt. The belt ran between a pair of induction coils on its ‘tight’ side. As the magnets passed between the coils, electrical power was generated. I’d say “Sheer Genius!” but would question it’s power output. With the advent of hybrid cars, is it still necessary to drive an alternator via mechanical means coming off the engine? Why not an electrical motor to spin a dynamo/alternator? At least with your electric motor your spin rate is controlled to a specific value in terms of rpm. Alternators spin with the speed of the engine and it seems that the power loss of belt driven ancillaries is not necessary. Most modern cars now use electrically assisted power steering pumps. So an electrical motor driven alternator like a perpetual motion machine? Brilliant! HH, no you said perpetual motion machine, not I. In hybrid technology some of the charge back to the battery is from the wheels. But thanks for your snarky response anyway. Amazing to hear stories like this, Ray. I’m sure you have many more! That pinninfarina built concept reminds me of the Ogle designed Reliant Robin! 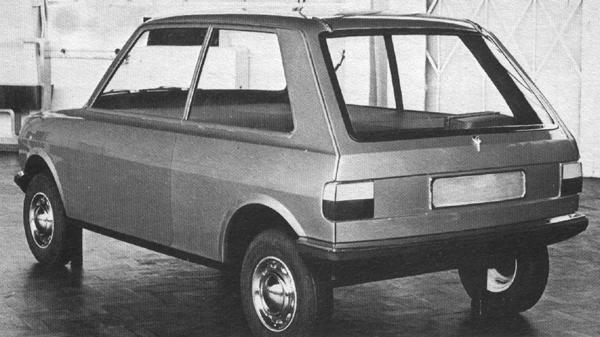 If the management who came up with the hair brained idea of putting the 1750 E into a small family car had the ability to visualise the front profile required to fit around it, they would have just put Marina door handles on a the ADO16 sized 9X, saved some money & tasked Harris Mann with trying to drag the Maxi’s styling at least into the late sixties or some similar project. Up to date would have been too much to ask with 1963 doors. In the pre-launch days of ADO67 Allegro, Harry Webster and Ray Bates were the big beasts in the Engineering Block at Longbridge. Bates was a big man whereas Webster was small and slight in stature. Bates test drove the ADO67 one weekend and came back saying that the throttle action off-idle was too fierce for his Size 12 shoes (unlike Webster who had no trouble with his Size 4s). This led to kangaroo starts from the traffic lights. I had the job of redesigning what we called the ‘snail cam’ throttle lever on the SU carburettor. But whenever it was ‘soft’ enough to satisfy Bates, Webster would say that the throttle pedal had too much movement for too little throttle action. There was no compromise. Some management report must have said that we designers were too close to our individual parts and too far from the whole cars. We were unable to see the BIG PICTURE. The answer was to erect a dozen or so trestle tables in the Engineering block and to cover them with every single component of an ADO20 Mini. Each part was tagged with its part number, material, weight and cost. It took a couple of days before I noticed the shiny new alternator had been substituted by a rather secondhand oil-covered unit – though still with the tag attached. Over the next few weeks, many of these new parts went missing and I even could name one designer (who raced a mini), figuring out how he could remove the entire body-shell one weekend without removing the double swing-doors into the block. It interesting to note that the Gearless Mini appeared to be inferior in terms of efficiency to the shelved Hydrostatic CVT / H-CVT system that BMC previously investigated (to the point where the H-CVT transmission could last for almost 100.000 miles and approximately add £2 more to the cost of an existing Mini or 1100/1300 equipped with Hydrostatic CVT), read that despite Issigonis and others dismissing the Hydrostatic system Duncan Stuart via his wife’s Hydrostatic Austin A35 prototype believed the system had much potential had it been fully-developed. Noticed from reading the Jon Pressnell book that the Body-in-White image of the Mini-Mini project which later evolved into 9X featured the same front-end to the 3 Mini-based 9X prototypes, though seemingly designed to have a similar-sized front grille treatment to the Barrel Car project. 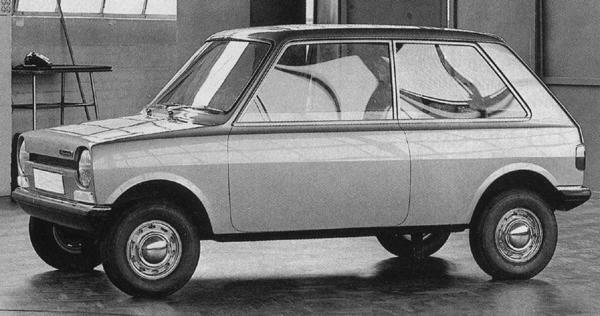 Perhaps once the Mini-Mini project evolved into the clean-sheet 9X, the design and styling elements from the Mini-Mini went on to form the basis of the Barrel Car from those within BMC either favoring an evolutionary approach to replacing the Mini or possibly conceived as an exercise to challenge Issigonis’ creative thinking for 9X (akin to the Minki-II project for the BMW Mini)? Pretty car and very clever but seemed to be barking up the wrong tree – the A-Series was one of the best bits to be found in any BMC/BL car for many years but the oil-sharing gearbox, which also shoved up the height of the engine, needed to be binned. 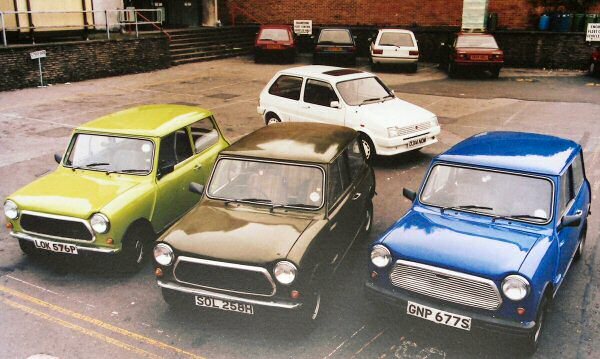 Similarly, the Mini didn’t need to be any smaller but could’ve done with being a bit bigger! sadly the 9X may have been much the same. This car would have been bang on for the 1970’s. Did the fact it was all new kill it? Surely they could have kept the A series, saved a packet on development, helped the business case and ended up with a very similar product that would have remained very competitive at that time? Turning circle, how long the exhaust lasted and how easy was it to get to the spark plugs was all buyers in this market where concerned with. An A series powered X9 would have ticked all those boxes. 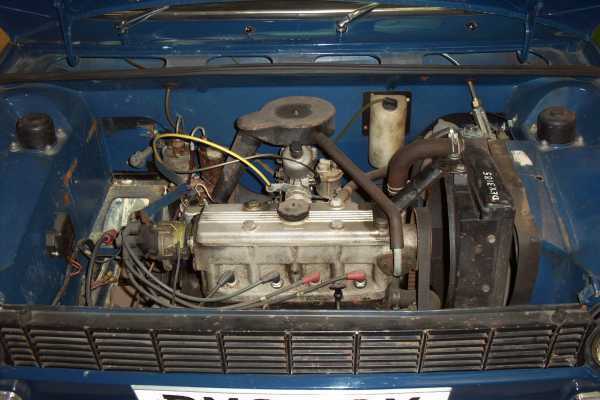 The A-Series engine was too large for the clean-sheet 9X hence why Issigonis developed a new compact engine. 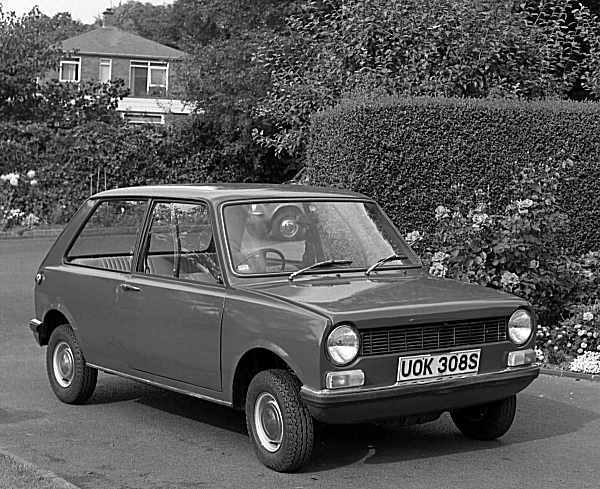 British Leyland should have looked to replace the original Mini by the early seventies when they would have got wind that Fiat and Renault were developing superminis with more space and in the case of the Renault, a very useful hatchback. 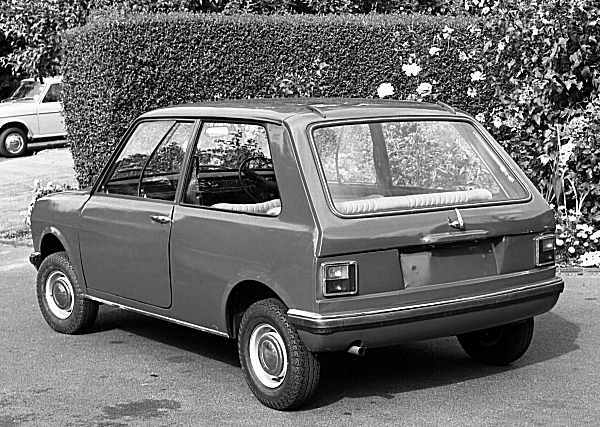 As the seventies went on, the Mini became severely outclassed and faced major competition from Fiat, Ford, Volkswagen, Chrysler, Datsun, Renault and Vauxhall( the three door Chevette was seen as a some kind of supermini hatchback), whose products were far more modern, had much bigger boots and often had more refined and powerful engines. I reckon had the Mini been pensioned off, or continued as a cult item, by 1973 and replaced by something like the 9X, though with better styling than the original Issiginos car, then British Leyland could have been a serious contender with a car that could take on something like the Ford Fiesta, which really ate into the Mini’s market share after 1976. As for the name of the car, how about Metro, a name that would save the corporation in the early eighties, and the car being offered with 1098 cc and 1275cc A series engines and a sporting option. Have read claims of the 9X prototype not only potentially spawning the larger ADO16-replacing 10X project, but also there allegedly being room in the design for an ADO17-sized car on the basis that both the 9X platform and drivetrain were extremely scalable. It is worth noting while 6-cylinder versions of the 9X engine displaced around 1200/1300-1500cc, the 9X gearless prototype used a 1.5-litre 4-cylinder version of the 9X engine equating to a 6-cylinder with a theoretical 2.2-litre displacement. Which does not really make sense given the presence of the 1.5-litre E-Series / 2.2-litre E6, unless Issigonis had second thoughts about the underdeveloped E-Series and sought to create a new engine family to quickly replace it (or have the E-Series repurposed into a larger 1.6.1.75-litre+ / 2.4-2.6-litre+ engine).